Serving as an ongoing showcase for some of the best and heaviest bands emerging from the underground, each instalment shines a light on those worthy of your attention. Consisting of one, 12” slab of multicoloured vinyl with full colour sleeves and inserts, the series is designed to be saved and treasured, like a fine anthology of books. So much so, when the albums are filed next to each other, the complete collection of aligned spines forms a mind-blowing image direct from the underground. 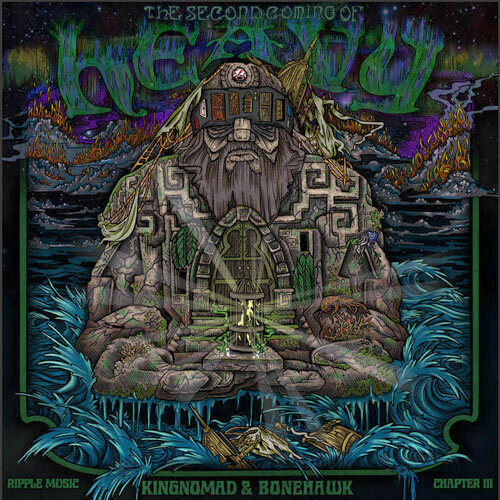 Following on from the series’ first instalment released last summer featuring Geezer and Borracho, and February’s Chapter II’s split between Supervoid and Red Desert the latest chapter, released this June offers up new music from hard hitting Michigan quartet BoneHawk and Sweden’s Kingnomad.